Banner stands are a great way of creating a professional, yet extremely cost effective way to promote your product, business or service. Banner stands are stand-alone display units that you can carry to any event and erect in seconds. Most importantly, they can be used over and over again giving you great return on your investment. PMT offer every banner stand available on the market from all the stand manufacturers in the UK. The range is that big, we could not fit them all on our website and to be honest, you would be overwhelmed by the choice. All banner stands fall in to three categories; Budget banner stands – the value for money range where the stands are more compact and used for one off events and not frequently rolled up and down; Mid-Range banner stands - to stand up to regular use, to be used at several events and exhibitions and are composed of durable materials which won't look tired after the first showing; Premium banner stands – which have an extremely durable roller mechanism and high grade of aluminium used in the base unit and are designed for long term active usage and for the high end events. Our best seller for each of the ranges are shown below. 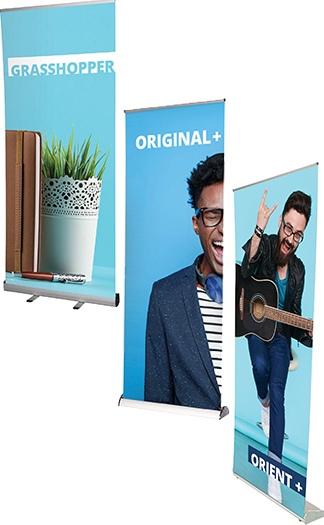 If you would like to more banner stands including roller banners, cassette banners and static banners please click here for our online catalogue. If you would like some help deciding or you have any questions relating to Banner Stands, please call us on 01480 493666. This is the most popular Budget banner stand in the UK. We sell thousands of units per year and we retain repeat orders based on the quality and value for money. (There are cheaper models available on the market, but these are usually poor quality imports, that are inconsistent and regularly break. We do not recommend these). The Grasshopper has twin twist out feet for stability and comes in a customised carry bag. This is our most popular Mid-Range banner stand and has been around for many years. The Orient Banner Stand is a popular stylish roller banner with a sleek new-look shape and some additional new features - the new front-loading graphic pulls up from the front of the base giving your message floor to rail visibility. The Orient now has adjustable feet on both sides making it ideal for levelling on uneven surfaces and also features a new design high-specification carry bag with extra padding for durability and protection. Available in 800, 1000, 1200, 1500 and 2000mm widths. The Original is a great all round banner stand, perfect for everyday use and built to last. This stand uses a hybrid telescopic pole so you can change the height of you graphic to fit the desired height. The base unit is available in stylish aluminium or a sleek, unobtrusive black and comes with adjustable stabilising feet for those uneven floors. Available in 800, 850, 1000, 1200, 1500, 2000, 2400 and 3000mm widths. A lot of people already own banner stands but the graphic has either been damaged or the message has expired. The stand and mechanism are still in good working order – so all you need is a new graphic? Begrudgingly the majority of people throw the old units away and purchase brand new ones when they need new graphics. PMT are not like that, we care and offer a service to ‘re-skin’ old graphics when the customer returns there old stands. Our skilled technicians give an honest assessment on receipt of old stands and if we can replace the graphics we do. This saves you money and also saves the environment. Alternatively, if you know the graphic needs to be replaced regularly before you make your initial purchase, why not buy a cassette roller banner. A one-off payment for the whole stand is then followed by subsequent purchases for just the cassette with new graphics. 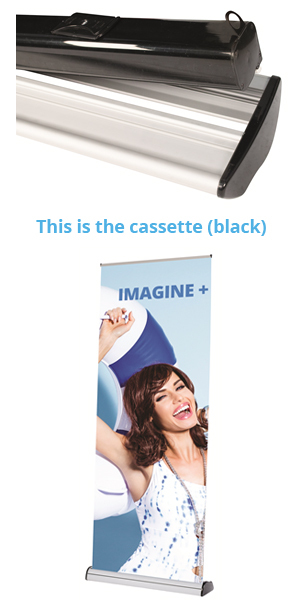 Our best selling cassette roller banner is the Imagine stand and is perfect for use every day. Swapping the graphic cartridge is really fast and easy, simply remove and insert the cartridge through the base and pull up your banner graphic. Please give us a call on 01480 493666 to see how we can save you money by re-skinning your old stands or providing you with a cassette banner stand that is cheaper to replace the graphic. Get your message seen from a far, with one of our freestanding giant banner stands. PMT offer a range of large banner stands that are not only wider than the standard banner stand but are also taller! 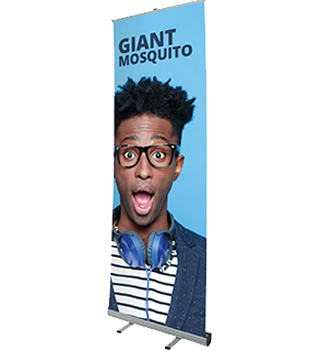 Our best selling large budget banner stand is the Giant Mosquito and is one of the largest you can buy. This stand is an amazing three metres (3m) tall and is available up to 2m wide! That’s 6m2 advertising space which is the same as the average shell scheme exhibition stand and it’s portable and reusable! The Hybrid pole is quick and easy to use and can be set a various heights to suit your graphics. 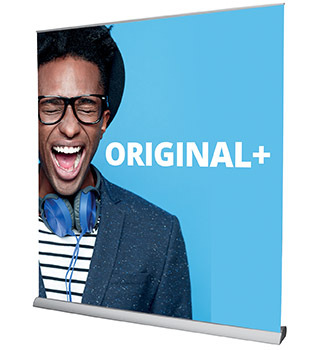 Our best selling large Premium banner stand is the Original+. The Original+ is a good all round banner stand and is available up to three metres wide. This stand has a sturdy base with the two adjustable feet to ensure that the banner is always level. Set the graphic height with the hybrid telescopic pole to your required measurement, allowing you to display over 6m2 advertisement space! Available in stylish aluminium or sleek unobtrusive black, this stand really does look the business.